Motorcycle handlebars are the steering mechanism for motorcycles; the equivalent of a steering wheel. Besides steering, handlebars also often support part of the rider's weight, depending on his riding position, and provide a convenient mounting place for rear view mirrors and controls such as brake, throttle, clutch, horn, light switch, kill switch, etc. 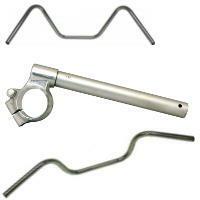 Handlebars are made from hollow metal tubing that is bent to the desired shape. The material most commonly used is mild steel or aluminium alloy. Holes may be drilled for the internal routing of control cables such as brake, throttle, and clutch. Ape hanger handlebars rise far above the mounting location so that the rider must reach up to use them, hence the name. They are popular on chopper motorcycles. The clip-on is a handlebar style, popular on sport bikes, in which two separate short handles are attached directly to the fork tubes, as opposed to a standard one-piece handlebar attached to the top of the yoke. Drag bars are nearly straight across to create a forward-leaning and aerodynamic riding position. Pull backs slope back toward the rider to allow a relaxed riding position. They are popular on cruiser style bikes. Motocross bars are tubular bars that are clamped onto the top yoke. They are common on motocross and off-road motorcycles, as well as dual-sport, streetfighter, and supermoto bikes. Nearly all modern bikes use handlebars with a diameter of 7/8 of an inch, (22mm). Harley Davidson and some Honda customs use 1 inch, (26mm), bars. These are sometimes known as 'fat' bars. The term 'rise' refers to the height that the grips are above the mounting location. This can vary from 0 inches to 20 inches (508mm). Risers/triple clamps hold the handlebars above their mounting position on the top yoke, (triple tree) or the top of the fork. They may be integrated into the bar itself (welded on) or separate items. As a motorcycle engine operates, vibrations from the engine pass up to handlebars. There will be little vibration near the clamps but more vibration towards the free, lighter ends. Constant vibration can strain fragile or fatigued wrists, and cause numbness or tingling even in healthy joints. A good pair of handlebar grips and foam lever sleeves can cushion your hands from the impact, while handlebar end weights are used to dampen the movement by adding weight and therefore restricting the amount of movement in the handlebar ends. 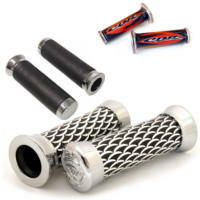 Grips and End weights are often available in many colours and styles and generally will fit any standard handlebars. 'Fat' or 1 inch handlebars will require 1 inch grips and end weights. Even when gloved, the hands are the most exposed part of your body while riding. So when the weather turns nasty your hands will be receiving the worst of it and numb fingers make operating levers exceedingly difficult. To protect your hands, you can use hand guards, which shield the hands from the front for the wind, or muffs which envelope the whole hand to keep the rain out and the warmth in. 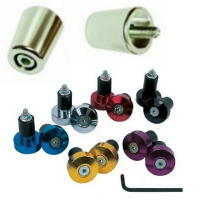 Like the grips these are available in a multitude of colours and styles so you can choose one to match your motorcycle. Heated grips are another solution. These use a small amount of energy from the battery to heat underneath your fingers and prevent them from becoming numb with cold: excellent if your gloves or muffs have become damp or if the body heat from your hands just isn't doing the job. 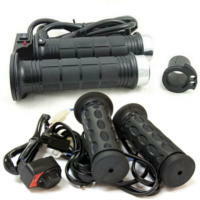 Heated grips are available as replacement grips or as heated pads that are placed around the original grip. Most come with low and high heat settings and a good pair will reach peak temparature in half an hour depending on how extreme the weather is.